Top loading balance: Ohaus Portable Navigator Series Electronic, Model NV-210 (Ohaus Corp., Pine Brook, NJ) for measuring body weights. Figure 1 A: Stratatec SA+ peripheral quantitative computed tomography (pQCT) for measuring entire cross-sectional area of the mid-thigh muscle. Figure 1 B: Screen output example from pQCT. Figure 1 C: Digital hand caliper for measuring bone dimensions. Figure 1 D: µCT 40 for assessing bone geometry and density. Figure 1 E: Screen output example from µCT 40. Figure 1 F: MTS system for testing biomechanical properties of bones. Mice are are acclimated to housing conditions until 16 wks of age and then to testing conditions for at least 0.5 h.
a. Adult 16-wk old mice are weighed using a top-loading scale. b. After recording individual body weights, the mice are euthanized by decapitation using a sharp gauze scissors. c. The bodies are then necropsied for any gross morphological abnormalities. d. Apparently healthy hindlimbs are skinned and harvested (see schematic diagram in Figure 2 A) and then further processed according to phenotypic measurements to be obtained. e. Left hindlimbs are skinned, wrapped in physiological saline-soked gauze to prevent desiccation, and then stored frozen in -20°C for for later measurements. f. The remaining right hindlimbs are also skinned and then immediately placed in the Stratec SA Plus peripheral quantitative computed tomography (pQCT) densitometer (see Figure 1 A-B above) to obtain mid-thigh area measurements. g. Three scans are obtained at 1 mm intervals at the mid point of the diaphysis such that estimated cross-sectional muscle area measurements, the mid-diaphysis cross-sectional area are determined and then subtracted from measured values of thigh areas. h. No correction factor for the cross-sectional muscle area is applied due to the inability of the SA Plus to sufficiently discriminate and quantify the small areas occupied by deep tissue vessels, nerves, and surrounding fat. i. 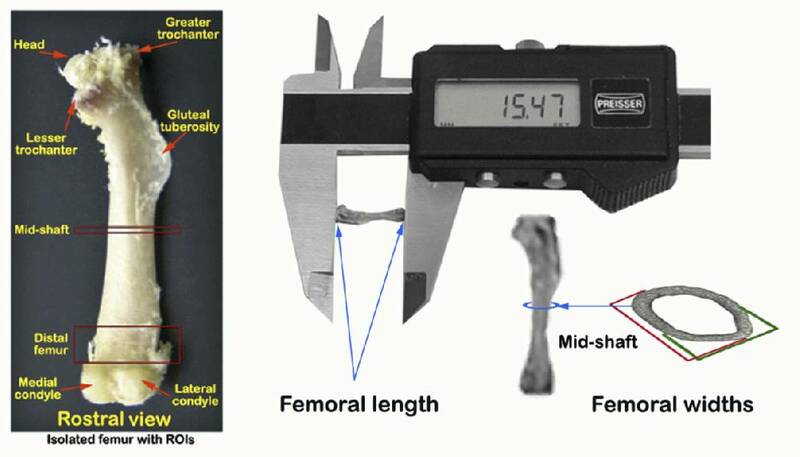 After right mid-thigh area measurements are obtained, the right gastrocnemius muscles are dissected, harvested (see example in Figure 2 B), and weighed using an analytical balance. j. Remaining right thighs are further dissected free of all muscle and connective tissues to isolate the femoral bones (see landmarks in Figure 2 A and C). k. Dimensions, including femoral lengths, rostral-caudal (anterior-posterior) widths, and medial-lateral widths at mid-diaphysis, are then taken from freshly isolated right femoral bones using a hand-held digital calipers as illustrated below. l. After recording right (mid-shaft) femoral bone metrics, the right femoral bones are placed in 95% EtOH for at least 2 wks to remove fat contents. In pQCT, as in DXA proper, quality control and calibration steps are necessary and performed according manufacturer's instruction. a. Femurs incubated in 95% EtOH for at least 2 wks are scanned at mid-shaft to obtain cortical thickness, using pQCT (see Figure below). b. In addition to cortical thickness, cross-sectional geometry (inner/outer circumference), volumetric bone mineral density (vBMD), and bone mineral content (BMC) at mid-diapysis are also obtained (see Figure below). c. To obtain cortical bone areas and surfaces, an outer (and inner) threshold of 710 mg/cm3, which allows the separation of bones from soft tissues, is used because of resulting values are consistent with histomorphometrically-derived values. 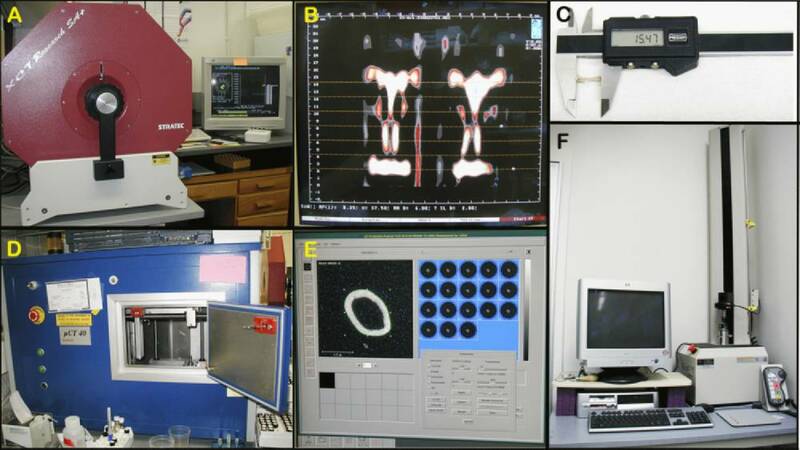 d. To determine femoral bone mineral contents (BMC), a second scan analysis is carried out with an outer and lower threshold setting of 220 mg/cm3, such that minerals from most partial voxels (0.07 mm) are included in the analysis. a. Frozen left thighs are thawed in fresh saline solution. b. As in step I-f above, the freshly thawed hindlimbs are placed in pQCT) densitometer to obtain mid-thigh area measurements. c. After obtaining cross-sectional thigh (bone and muscle) areas, muscle and connective tissues are removed to isolate the left femoral bones. d. Isolated femoral bones are then scanned to obtain whole femur vBMD, cortical vBMD, and cortical thickness using pQCT densitometer. e. As in steps II-c-d above, bones scans are analyzed with two different outer threshold settings to separate bone from soft tissue densities. f. Following whole femur volumetric bone mineral density measurements, the bones are also measured for femoral length and widths as in step I-k above for the right femur. g. After obtaining femoral bone metrics, the femurs are subjected to three point bending tests for biomechanical properties using a MTS Systems ‘Qtest/1L instrument (see Figure 1 F above). h. Femurs are placed with condyles down and centered on stationary supports 6 mm apart. i. Force is applied at 0.05 mm/sec to obtain the force displacement relationship using the 100 g load cell for each bone. j. Force displacement curves are then generated for each femur. k. Resulting measurement data are analyzed using the manufacturer's supplied TestWorks®4 software. a. Femurs incubated in 95% EtOH for at least 2 wks are also scanned at mid-shaft using µCT 40 (see Figure 1 D and E above). b. Initially the femurs are scanned at low resolution, with an energy level of 55KeV, an isotropic pixel size of 12 µm, and slice thickness of 12 µm. c. The values obtained above are then used to calculate the cortical thickness (µm) of the femurs at mid-diaphysis, to be compared with values obtained using pQCT. Submitting investigator's notes: Precision of the pQCT SA Plus for repeated measurement of a single femur was found to be 1.2%. Due to variation in femur lengths, the femoral head could not be scanned at the same location for each bone, and thus was not included in final data. Midshaft values were determined from the midpoint slice, typically slice 4. We found that correlation between total and cortical vBMD values at the mid diaphysis was very high and nearly identical for females (r = 0.923) and males (r = 0.929, Beamer, unpublished data). Therefore, mid-diaphyseal total vBMD, which captures all mineral (subcortical and cortical) as well as all volume (subcortical, cortical, and marrow) was used for subsequent data analyses. For safety, gloves must be worn and radiation safety guidelines are strictly adhered to, such that technicians must be behind portable shields. A dosimetry badge and ring must also be worn. Since both the scanning equipment and the computer present icons that indicate the "ON" status of the X-ray tube with open shutters, precautions and any possibility of exposure should be avoided. Total volumetric mineral density (vBMD) values are calculated by dividing the total mineral content by the total bone volume (bone and marrow) and expressed as mg/mm3. 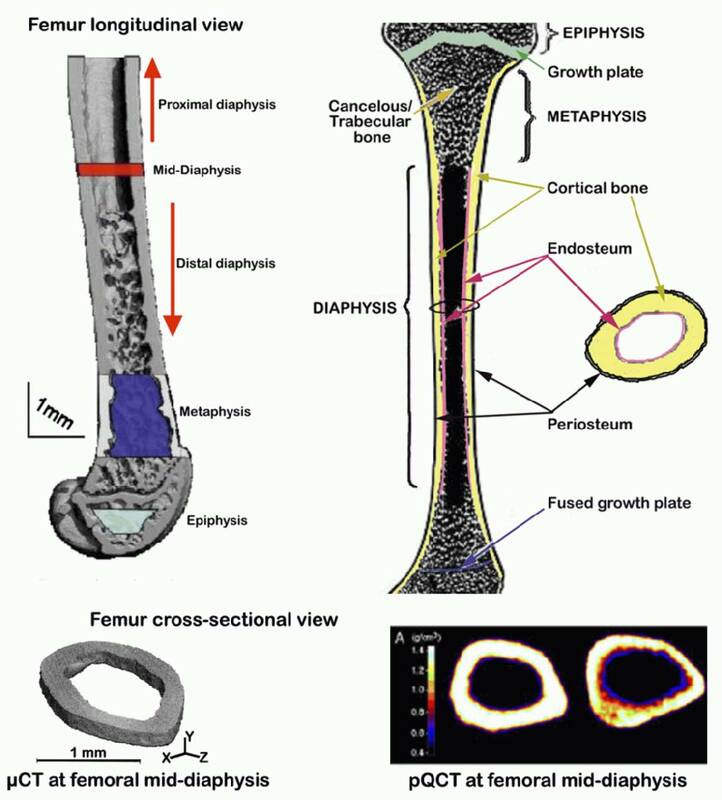 Femoral bone dimensions (length, width (anterior-posterior, medial-lateral), cross sectional area), cortical thickness (right and left femur), femoral bone circumference (periosteal, endosteal), bone mineral density (BMD) of whole (left) femur, BMD of left cortical shell, right femur bone mineral density (BMD) and content (BMC) at mid-diaphysis. Weight of isolated quadriceps muscle, total thigh and thigh muscle areas in cross section at mid-diaphysis, femoral bone biomechanical properties (displacement curve, break point, 95% break load, displacement), and femoral bone strength and fragility (intrinsic stiffness, extrinsic stiffness, ultimate force, modulus of toughness, work to failure) from isolated femoral bones.